I am an Unorthodox Christian. Whilst being christened under the Church of England and attending a public school with some of the most dogmatic Thursday-religion-class teachers I’ve ever suffered through might give me a great springboard towards becoming a forward-thinking, God-loving Christian without additional appellations, it wasn’t meant to be. The boring version is that there were personal issues and crises of faith during and post-High School, and in the end I came to the decision I believed there was a God (made up of only the better parts of his description), that a couple of the things in the Bible were alright, and that there was a Heaven. That was where I drew the line. The biggest problem I find is that it’s difficult to reconcile the notion of a benevolent, loving, all-encompassing entity who also practices an almost dictatorial way of life that ensures only the best brown-nosers are ensured a place at the top when the Rapture comes. If God really does love each and every one of the delicate little snowflakes living in his planet-sized ant farm, why is he stricter than even the most stringent military procession in terms of how we live and how we die? If we’re meant to be free from the tyranny of sin, why is there a laundry list of protocols that determine what we are and aren’t allowed to do between cradle and grave? Doesn’t the idea of a strict adherence to rules not only defy the notion of free will and love of the world that we have ingrained in us since birth, but also creates a dichotomous entity in the form of our Father who art in Heaven, offering us the good afterlife if we toe the line downstairs? Obviously the ideas of Christianity, as well as the arguments for and against, are far too vast and complex to be resolved succinctly over the course of a few paragraphs, or indeed within the pages of a book like Punk Rock Jesus. So put all my religious blathering aside for a while, and we’ll get into what you actually came here to read about. The story, penned by Sean Murphy, is simple in premise but massively layered in execution; in a near-future where reality television is taken to its logical conclusion and becomes probably the most world-encompassing social presence since Facebook, a show company manages to create a clone of Jesus from DNA found on the Shroud of Turin implanted in a teenage virgin. The child is raised on a secret island as part of the “J2” show, which turns out to be the biggest ratings success ever (quoted as having the viewership of 27 Superbowls-worth of gormless social pollutants). Far from being a new Eden, the island and its master, Rick Slate, turn out to have less than savory plans for both the reborn messiah and his virgin mother, and things quickly spiral out of control. The narrative follows years in the lives of several characters aside from the titular musically-influenced protagonist, showcasing not only the negative effects of both reality TV and the drive for bigger ratings, but also the extremes religion can go to in order to get their point across – both with disastrous results. 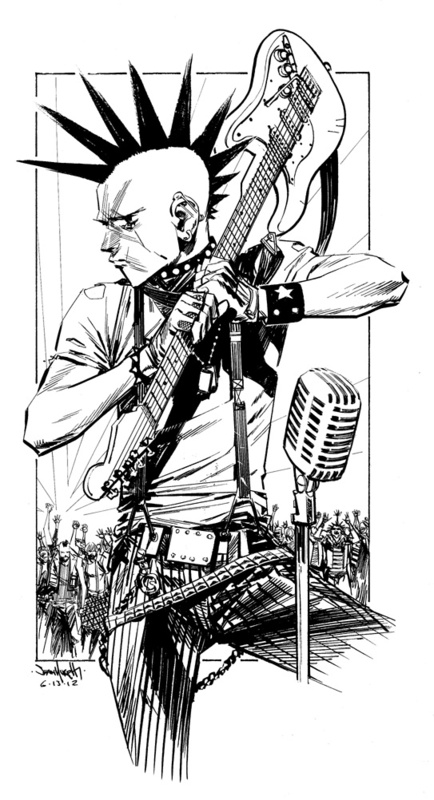 The Punk Rock part comes in when, as a young adult, Jesus 2.0 joins a band to spread a message condemning the church, proclaiming his status as an atheist and inciting the people to rebel against those responsible for the reality show. While it’s very easy for any creative or factual work to point at Christianity and label the Church as a bunch of child-molesting, moral-less thugs, it’s difficult to express disdain for their practices in an intelligent, grounded manner that still manages to have an impact without turning into a rambling author tract. Similarly, simply calling the money-hoarding masterminds behind Keeping Up with the Kardashians a load of talentless whores just doesn’t cut it as part of an intelligent and meaningful discourse. Both these points are masterfully executed by Punk Rock Jesus; points for and against both the church and the TV show are pulled off in a fashion that strongly, and intelligently, points out the minor and massive flaws inherent in both concepts. The scary dogma of the former and the hyper-fiscal drive of the latter are presented as their biggest (and, in some cases, most evil) traits, neither being shown as something to aspire to. The character dilemmas while interacting with both institutions also avoid the pitfalls of having a simplistic, one-sided disagreement with either one (that is, the characters don’t dislike either establishment simply because “they’re evil”). To be succint, Punk Rock Jesus is fantastic. Utterly sublime, from start to finish. The plot is engrossing, the characters are fleshed out and believable in both flaws and strengths (including the truly morally reprehensible antagonist, who’s probably the most evil black-and-white-illustrated comic villain since The Governor), and there’s very little of the book that feels extraneous. The arguments against the church and reality TV, clearly fuelled by Murphy’s own thoughts on both matters, manage to be presented intelligently while still smacking the crap out of their intended targets in a way that satisfies the reader immensely. In addition, if you really don’t see the appeal of the new messiah being a mohawked, anti-establishment punk rocker who leads his fans the way a trigger-happy American General might lead his monkeys into a third-world country, then it’s probably time to reassess your life choices. The artwork is great, but at times a bit confusing. 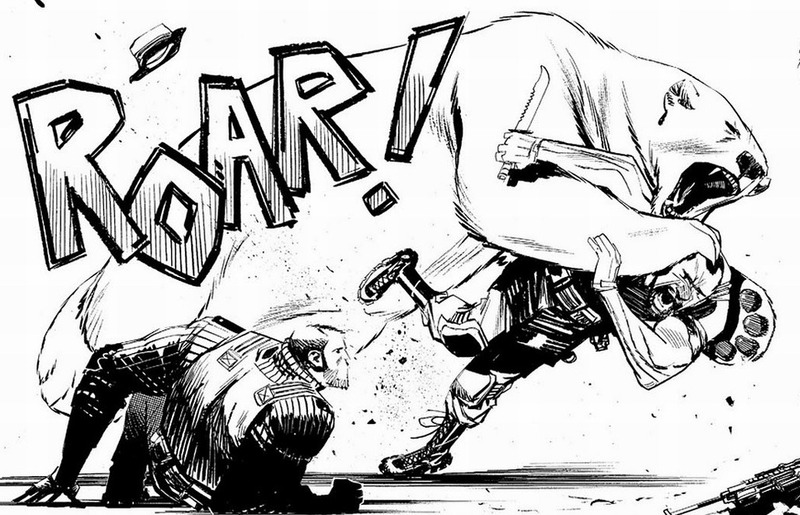 One of the major problems faced by a black-and-white story is that the visual layers can get confusing if there’s not much definition between them, making important elements fade into the background of associated paletting. It’s not a big complaint, but there were a few moments where people or things I was supposed to notice prominently seemed to blend into the rest of the landscape. It’s also difficult to differentiate characters if they have similar faces and there’s no distinct colour variation in their outfits, which is a similar problem The Walking Dead faced. Again, not a huge issue, but it does throw you out of the reading a little when the awesome big guy character you’re meant to be liking turns out to actually be the evil big guy character who looks like his evil twin brother and is busy throwing another sackful of children into a trash compactor. Where the artwork falters, though, the dialogue compensates. At times the tone can shift a little too awkwardly into black comedy from the serious roots of the piece, and you might think the inclusion of a punk-rocking Jesus after the opening first half of emotionally-charged world-building is a little incongruous, but overall it blends together beautifully in a way I’d not have thought possible. There’s wit, there’s drama, there’s some really heartwarming moments and there’s more obscenities than an episode of South Park dedicated to fornicating. 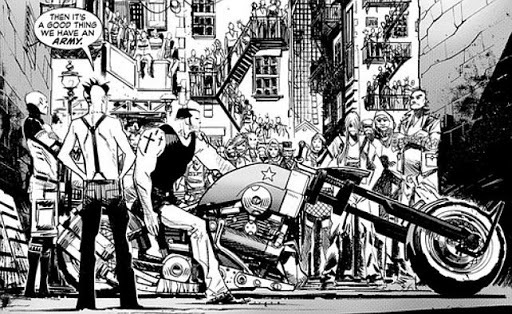 I really get the impression that Sean Murphy has been working on this for a long while as a labour of love, something he says as much in the afterword, and it really shows. I’d almost go so far as to call it a comic book equivalent of Inception; it’s a magnum opus, lovingly crafted from the ground up and polished long before it ever hit the media circuit, backed by a story and characters that the creator really seems invested in. Punk Rock Jesus is one of those rare delights where incongruity and social commentary fuse together to create something fantastic, and the end result is a tale that left me thoroughly satisfied. Now if you’ll excuse me, as an Unorthodox Christian it’s time for my daily prayer to Batman. BEST QUOTE: “HELLO AMERICA! The most Christian nation on Earth! The one that God has blessed! This is Jesus Christ, coming to you live from Lower Manhattan, telling you all GO F**K YOURSELF! JESUS HATES YOU!” – Chris.